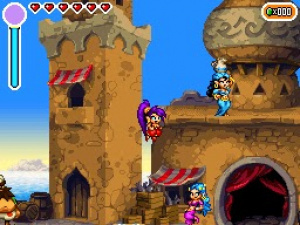 When the original Shantae was released in 2002 on the Game Boy Color, it was lauded for its amazing animation and challenging platforming action. Unfortunately, this was after Nintendo had launched its new Game Boy Advance system, and sales of the unique title never really reached the level many expected them to. Of course, that hasn't hindered the game from becoming one of the most highly sought-after cartridges on the second-hand gaming market or kept long-time fans from clamouring for a sequel for the past eight years. 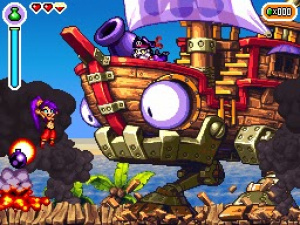 Now with the release of Shantae: Risky's Revenge on DSiWare, WayForward has finally answered the prayers of Shantae fans and kicked its rather adorable half-genie back into action. Much like its predecessor, Risky's Revenge places a heavy emphasis on the platforming aspects that made the original so popular. As solid as the gameplay was in the Game Boy Color original, the developers have somehow managed to tighten things up even more for this sequel. Not only is the action a bit faster, but the attacks and jumping mechanics seem even more responsive this time around. You'll also find that there's quite a bit more exploration in this sequel and it really adds a nice added layer of playability to the overall package. You'll quickly find that you'll have to speak to the various characters and townspeople throughout the game in order to gain clues as to what you need to do and where you need to go next. Long-time fans will immediately recognise Shantae's trademark hair-whip attack, and it's as deadly as ever. You'll even be able to purchase upgrades to make it not only execute faster but also more powerfully. You'll be able to purchase various items in the town store as well, including many different types of magic attacks and healing potions that can be quite useful in some of the more challenging sections of the game – not to mention the rather intense boss fights you'll face during your chase for the magic seals. 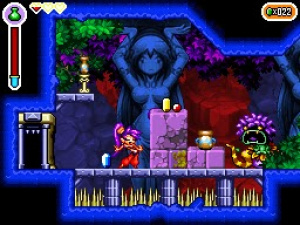 To add even more depth to the gameplay system, the developers have included a rather unique function that involves locating certain hidden animal transformations that allow Shantae to turn herself into various animals by using her belly dancing ability. These range from a monkey that can climb along walls to an elephant that can break down certain blocks and boulders by charging into them. Not only are these techniques useful in navigating Shantae to previously unreachable sections of the game, they can also be rather handy in taking out some of the tougher enemies as well. One thing that can be said for certain of Risky's Revenge is that you'll never find yourself at a loss for things to do. There's plenty of platforming to test your reflexes and enough hair-whipping action to please even the most ardent side-scroller fans. Not only are the controls themselves perfectly implemented and responsive, but the sheer level of variety between the various attacks and magic – not to mention the animal transformations – is astounding. Toss in some exploration elements, and you've got one of the most well-rounded 2D platforming adventures you're ever likely to experience. With the file size restrictions of the DSiWare service, it's understandable to see developers try to keep things simple from a visual standpoint, but someone obviously forgot to inform WayForward. Not only is the game chock full of lush landscapes, complete with multiple layers of parallax scrolling, but the individual characters and enemies show the type of animation that would even impress by retail standards. There are plenty of vivid colour schemes to go around and enough background detail to really bring the Arabian world of Shantae to life onscreen. It's clear that the developers put a lot of time and care into the visual production, and it pays off big in the final presentation. To further complement the game's amazing scenery comes a musical score that couldn't be any more fitting for the type of environments you'll find yourself in throughout the game. The Arabian musical stylings do an outstanding job of carrying the unique theme of the game along and, much like the visuals, there's plenty of variety. There's not a bad track in the bunch, and you'll constantly catch yourself looking forward to the next section of the game just so you can hear what the next audio track has in store for you. The same can be said of the sound effects as they offer a good amount of variety as well. It's nice to see that even though a lot of emphasis was placed on the visuals that the developers still made time to get the audio presentation right. While we've seen a lot of titles released on DSiWare since its inception, very seldom have we encountered a game that features this level of polish and refinement in virtually every facet. From the gorgeous multi-layered visuals to the spot-on play controls, there's really not a single area of the game that won't wow you. In truth, we could sit here and lay down an almost endless number of reasons why you should download this game, but at the end of the day it really all comes down to this: Shantae: Risky's Revenge is hands-down the best title available on DSiWare and quite possibly the best 12 bucks you'll ever spend on a video game. Epic review! First 10/10 for a DSiWare game (I believe), and its well deserved! Nice job, Corbie! I agree with your score 100%, it is a perfect 10 in my book. After downloading the game, I was just worried it wouldn't live up to the hype, but in the first few minutes I noticed that the amount of polish and fun were top notch. Anybody who does not have this gem on their DSi menu, is really missing out. I'll get this as soon as I get a 3DS. What was the last time a DSiware game got a 10? Now theres no reasone for me to get it now.. This is the first DSiWare game we've given a perfect 10. I just started playing this last night. It's an absolutely beautiful game. Definitely worth the price point. And, as always, great review! Excellent, excellent, Excellent! Since my only complaint about the game is that it's too short, I guess that might be a GOOD complaint in the end since it means the game really is a 10, eh? Although, I am currious about one thing. This was supposed to be all three episodes on one download, right? I'm wondering where the episodes would have broken. @Bass_X0: No, you get it NOW, darn you! Now I really have no choice but to get this. Great and with so many other games to save for this CHRISTmas. Oh well looks like they will have to wait another couple of weeks now. Great review Corbie. @MasterGraveheart I'm guessing that means you beat it? How long should I be expecting to play for? I think it took me about 7 or so hours to go through it the first time, but I did miss a lot of hidden stuff along the way. I loled at the subtitle. I will buy this. haha. just beat this game. even a bit faster than corbie actually... phenomonal game, fantastic, i loved it. i just wish it was a bit longer. Does this game have good replay value and does it warrant multiple replays? I need this game, but I don't live in the right place. And I don't have wireless wi-fi. I'm getting this! ...As soon as I have net for my DSi. @Corbie 7 hours is a little short, but not too bad for a DSiWare game. I'll probably end up playing through it more than once anyway. Release it in the UK please. You'll get money for it, so I don't see a problem. Watching the video for this game earlier actually had me on Amazon about a minute later checking out the prices for a DSi - but with the 3DS on the horizon maybe I'll just have to wait. Ahhhhh!! Another great and blooming prompt review Corbie! Ten out of ten. HOMG. This just went from "interesting" to "so far up my most wanted list it's practically cosmic"
anyways i have a dsi and i'm planning to buy a 3ds will it be a good idea? "belly-dancing abilities" and "hair-whipping action"? Hmmm, might look into this after all... and also the 10/10 review helps too. Can anyone give me a clue as to where to go after receiving the Magic Seal from the Battle Tower? Saw that one coming from 8000000 miles away. Yep, this one is pure quality. Definitely deserving of the 10. The niggling bits are so minor that I really don't care about them. The characters are fresh and the gameplay is nostalgic and the aesthetic is total class. I love it! P.S. The review's tagline is awesome. No EU release date for this yet? Eep. It''l need to be rated by the ESBR and the OFLC first. And then Nintendo would have to decide whether to release it [shantae] or another Petz game. Granted, there aren't any more petz games on the horizon, but I'm sure they'll have time to make a few more to clog our release schedules before Shantae or even Cave story is released. Want, so badly. But I cant buy a DSi so close to the 3DS, sorry. So assuming the 3DS allows downloads of all DSiWare stuff, I promise to get it then. Hot damn. Didn't see that coming. Hope this'll be available on 3DSWare, since I have no intention of buying a DSi with the 3DS on the horizon. Ok, I stopped reading at "now". What am I supposed to do now Corbie? "while we've seen a lot of titles released on DSiWare since its inception," I assume that "inception" isnt being used the same way as the movie, but honestly i have no idea how its being used. This is probably the most off topic comment here, but can someone give me a definition? oh and im gonna get this game! @Exploder: The creation or beginning of something; the establishment. bought this and zenonia together, but I only bought them as a reminder to play them later. I just got 4 heroes yesterday and if I can beat that before Golden Sun comes out then I will play those games. It's fun, but it is NOT a 10, nor is it nearly as good as its predecessor. Thanks Nintendo, you really love the UK! Shall I go after the GBC original instead? Nope, the cheapest copy I can find is £100! I can't really say it was a great review Corbie, 'cause I didn't read it after you told me not to. Seriously though, I wish I could DL it, but it's not in Europe yet. Come on WayForward, America isn't the only place in the world that wants Shantae! This game is why I need a job. @9 So your telling ppl to buy a dsi just for a 12 dollar game come on just because its a 10/10. That doesnt mean go buy the system to play 6-7 hours game specially when a 3DS is on its way. But its good to see more quality games on the DSiware if this game was only 1000 points i would get it buy id rather but 20 bucks toward NBA Jam. After waiting so long to finally get the game, Ive been unable to actually play it because of surgery. Ill be starting it up here in a few hours or so and cant wait. I'm getting this... As soon as I've gotten all the other the other things I want. And school is taking up A LOT of my time, meaning I don't have very much time to spend on gaming... The holidays can't come soon enough! Ok, you've convinced me. Mostly. I can't remember if I've got 1200 points on my DSi or not, though, and I'm not sure I want to put another 2000 on it. WOW! First 10/10 and 800pts+ game ever for DSiware it seems... I will probably buy it when it comes to Europe. Great review Corbie! And the 10 is well deserved, I can't put this game down. It's just fun! Normally I'm quite happy with my DS Phat, but I really wouldn't mind the 3DS coming out soon so I could play this. @Besen: I've beaten the game, but I'm still hunting down the last couple items. I clocked in around 6 hours upon completion, but like I said, haven't found ALL the items yet. I'd say the average gamer can spend around 6 to 10 hours at it, more if you want to go for the apparent multiple ending images. Plus, it's a primo speed run game, I think. @Iggy: Pretty much. Not only are you supporting WayForward and future Shantae games by buying early and often, you're supporting Nintendo's next console with major purchases. 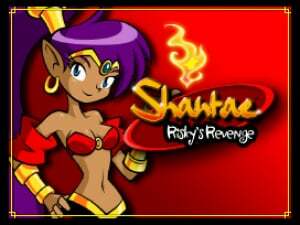 I don't own a DSi, but alongside Gameloft's Soul of Darkness, Shantae: Risky's Revenge is top of my list as a download when I buy a 3DS next year, (if it is available to download on a PAL 3DS, that is). The eloquence that WayForward displays with 2D game design in this, DS Contra 4 and Wii Batman: The Brave and the Bold, means that they are building a reputation in line with Japanese greats, like Treasure. WayForward are quickly becoming one of my favourite gaming devs, I hope they try their mastery at a shmup in the future. My jaw dropped, I was expecting a 9, but I have no problems with a 10. The game is amazing on every level, and it definally deserves that perfect score. @brandbwii go to the first area where the temple was. There should be something that needs the forest key that you got. @MasterGraveheart: They announced that you can transfer DSiWare to the 3DS, so it only makes sense that you'd have full access to the DSiWare shop as well. I pulled a 100% completion file at 6:22:22, according to the end screen. The game appears to have a Metroid Fusion/Zero Mission style of replay value going on, as the picture I got for the end screen was different between that ending and my first finish when I was missing five items. I'm strongly considering blowing through it at 100% again to see if I get a better picture for the shorter time. I hope the lack of DSi's among people who want the game doesn't impact its sales too negatively in the launch window...or alternatively, that WayForward pays attention to the 3DS promises and waits until then to decide how well this game did overall. The basic point being I want this to sell super well so we get more! Really regretting not picking up the GBC game for 4 bucks a few years ago. Saw it behind glass, didn't know what it was, walked away. Wow. This game was definately worth the wait! I REALLY need a Points Card now! If I wasn't concentrating so much on school right now and was working again, I'd sooo spend all of my money on a DSi and this game. I knew this would get the first 10/10 and I'm happy for it! @Stuffgamer1: Yeah, I heard about that part, and yeah, it makes sense, but truth is stranger than fiction, isn't it? @Gavin Neither Nintendo nor WayForward has said anything about when it's coming out. It's not even on the latest release schedule from Nintendo! As I always say in these instances, when we know, you'll know. First 10/10 for a DSiWare Title! All I had to do was look at the tagline to know whether I should get this game or not. Great review! Good for WayForward for making the best original game on the DSi. Another pretty good (puzzler) game by Wayforward . Buying this and probably zenonia... Yay, I'l be busy for a while! Oh wow, great review Corbie. I'll get this game sometime, just to see all the hype about it. Well, look at it this way: That's not even close to what the original goes for used. I wouldve rated it as 9/10 minus one point 'cuz the stupid NPCs never give you clear hints on what to do next. Example 1: I just beat the Ammo Tower... so what next, I got a FOREST Key... I seek help from the NPCs, and they tell me to go to the desert and get the monkey dash and Elephant... But WTF I actually needed to go to the forest. Example 2: I'm told "Go to the Boat House" by every NPCs... I searched the whole friggin' land to find that friggin' Boat House... Still couldnt find it, How about some Specifics??? Great game none the less... worth the buy. But this is the first 10/10 dsiware out of the 250+ games out and wayforeward should get it, over the time they put on this. One and a half years ago I heard this title was getting the sequel. And finally it's out. Please tell me you're kidding. If you've been at that battle for over an hour, you need to put down the DSi and take up stamp collecting or knitting. Something low impact. Oh and try hitting the barrel while it's in the ship's mouth. Ooh. But I need to save for the 3DS, which I must, must get day one, and if I buy this, I'll have to buy certain other DSiWare, and then I won't be able to get a 3DS day one. So, I pretty much have to pass. Dang. Guys by the time the 3DS comes out you'll have made another $12. Wow, worth the wait! Can't wait 'till AUS/NZ release! Corbie... an obvious platforming fanboy. So does this game have anything to collect besides abilities? Are there lives? When you lose lives do you start completely over or is there a checkpoint system? Any gameplay stats? Any user profiles? Sharp and polished as it may be, what about all these other aspects? Someone also mentioned the game is short. Any REPLAY value here whatsoever? And how many blocks of memory does this game eat up? Sorry, I'm an shmup fanboy. Platformers are more of a hobby. @supercommando440: No lives, thankfully. Falling down pits respawns you at the entrance to the room with slight damage (half a heart, I think). Losing all your health restarts you at your last save point. No "user profiles," just three save files. You get listings of how long you took and whether you got all 34 "special items" on the end screen...closest thing to "stats." As previously mentioned, there are likely different pictures to earn like in the GBA Metroid games for doing better, lending some replay value. Besides which, the game is awesome. I can't imagine NOT wanting to replay it sooner or later. The game is, as already mentioned in the comments, 128 blocks plus 1 more per save file. Any chance of this getting a WiiWare release? I am completely in love with this game. Great review. This is a good game but doesn't fit the bill for a 10/10. I understand fanfare and all, but game-wise it's an 8 (which is extremely good considering it's DSiWare imo. How can you put this in the league with other games that got a 9 or 10 out of 10 (ie: World of Goo, Mario 64, Super Mario 3, Super Metroid, LoZ:LttP, LoZ:Links Awakening, Chrono Trigger). You even gave it a higher rating than New Super Mario Bros for the DS. After playing and enjoying Shantae, there is no way I'd put it in that league of games. Because World of Goo, Super Mario 64, Super Mario Bros 3, Super Metroid, Legend of Zelda A Link To The Past, Link's Awakening, and Chrono Trigger aren't on DSiWare. It's difficult for games on completely different systems, with completely different circumstances, expectations, gameplay, and audiences to compete against eachother, you know. In fact, it's near pointless to do so. Shantae's a 10 in it's own right, according to Corbie at least, and even according to you, it's better than most DSiWare games, so what's the problem? I understand what you are saying on one level...but when you say 10 out of 10, you are saying it is one of the best games of all-time imo (i understand that may not be everybody's view). Those games that I listed (other than Goo maybe) are universally listed as top 100 games of all-time (regardless of platform, genre, or generation). If this site ONLY reviewed games for DSiWare, then I might buy into the 10 rating relative to DSi games available but Corbie rates games of all systems and generations. I don't believe in pumping review points up for games based on lowered expectations of a system (just because there is so much junk available on dsi or iphone for that matter doesn't mean the first good game should become a must-buy all-time great)...many of those games I listed could easily fit into a DSi download and are perfect for handheld portability (in fact some are portable). So, I don't think we're talking about comparing apples to oranges here. Check the scoring policy for this site, man. Really, these guys usually score things based on its own merits, who the target audience is, etc. One of the best brand new $12 games of all time, hands-down. How could that not get a 10? So, what are the extras you get if you've bought Mighty Flip Champs? Various amounts of gems you can spend in the item store. 100, 200, or 300, right? Are gems very necessary for completing the game? Depends on your skill level. Buying magic spells and potions can really help you out, but you can still earn money by defeating enemies. Anyone have any idea about an EU release date? Absolutely fantastic game, well worth the miniscule $12 price tag and the three days I had to wait for my internet to get over a thunderstorm. Deserves a 10/10 easily, best game I've played on DSiware so far, very reminiscent of old school platforming days. Wonderful. Nice review. Sounds like its the platformer I've been waiting years for. I haven't played this yet (stupid work eating up all my time during the week), so I'm looking forward to playing it tonight and this weeknd. "The way Shantae DSi layers levels into multiple tiers that look similar it's easy to get lost, or rather, it's easy to lose track of where you are or where you've already been." Is this true? One of the things that bothered me about Metroid (Espcially the first) and Castlevania (post-SoTN) games is that you can forget what you need to do next if you were away from the game for awhile, even with the map system. I have to agree with cangelo, the game is like an 8/10 in the grand scheme of things. All of the nitpicky flaws do add up like short overall length and poor map system. Sometimes I felt like I was having fun exploring just because I was lost at the time. Still a blast though. Don't worry. The levels are only "layered" twice, and one of them is the hub town, which doesn't have any dangers and is small and easy to navigate anyway. The other layered level is the forest, and I think that's part of the intention: to confuse you a little bit. But it's not difficult at all to find your way around, particularly with the map. Just make sure you visit each square and you'll find everything you need to find. I think IGN is exaggerating the disorientation that comes with the tiered levels. Only once is it actually employed in a real level, and it takes a grand total of about 10 seconds to figure out how to cope with it. Don't let that turn you away. @Chicken Brutus Oh the IGN review didn't scare me away. I bought it on Weds. Just haven't had time to play it yet (work day, including driving, is about 12 hours + busy weekend). I'm more concerned about the lack of a progress tracking system. After being away from a game for awhile, I usually forget what I'm supposed to be doing and end up running around until I happen to do it. I've had this happen to me in SoTN, Metroid (NES), and Castlevania: PoR. Anyway nice review Corbie~!! I couldn't have said it better myself. lol. 10/10? Seriously? Maybe it's just not my type of game, but it doesn't look THAT awesome. And holy CRAP, 1200 points? I would never, ever get it. Urggghhh................. 10/10.... BUT IT'S 1200 POINTS! My English DSi's DSi Shop points only go to a maximum of 800 points. >:L Plus, they still have to announce when this game will be in UK/EU. Again. I'm so sick of so many games saying that. Oh, well. At least I was able to get my hands on Aura-Aura Climber and Pop Island Paperfield. Nice review. This game must be pretty swell to have gotten a 10. Downloaded today and you can tell immediately that its the best DSiware game to date, only bad thing is ive had to wait a stupid amount of months to get my hands on it. After playing nearly 4 hours, I have to say that I am heavily disappointed. The map is terrible, all caves and dungeons look the same, the routes to search something are too long and boring, and I you die, you start on your last save point, which can be very nerving. @L.Brown: There are only 2 Dungeons, and I think they were differing from each other a lot (gameplay wise. They are graphically identical, but hey, it's a DSiWare game...). I just got points and I'm debating on what to spend them on. Is this game that good? If you have a DSi it's a must own, this game is awesome! Just got this game. It's totally worth the price! Shantae the only chick who should be allowed to whip her hair back and forth. Well other games get points put down due to high costs - but that seems to have been completely ignored for this game. Sure it's great - but is it really better than every 9/10 DSiWare that's been reviewed, considering it costs more? She should be in Smash Bros.
Can you buy this on a 3DS? @Corbs wasn't this review by @James?